We return from our Friday guest mix by Om Unit with another In Session episode from Dday One, our L.A resident and someone who also goes back to our roots with Om Unit back when he was still 2tall. 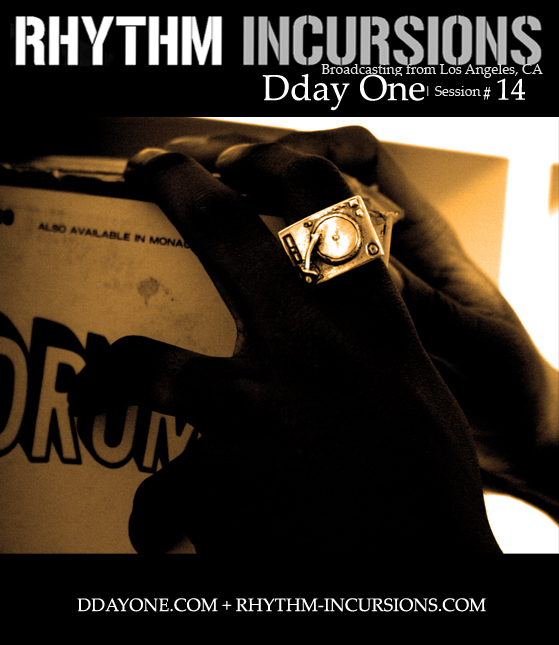 This time round Dday One delivers a straight up mix for your aural pleasure, number 14 of our ongoing series. This month’s In Session is jam full of oldies and new music including the likes of Rumpistol, DJ Krush, Jay Dee, fLako, La Funk Mob, Brand Nubian, Robot Koch and Instra:mental among others. As always you can download and/or stream below, or simply subscribe to our RSS/iTunes feed to receive all shows directly. Please note that as with other In Session shows the download link points to Dday One’s Bandcamp where the download is located. This entry was posted on Monday, March 26th, 2012 at 12:34 pm. It is filed under Podcasts, DDay One - In Session series and tagged with Dday One, DJ Krush, Jay Dee, DJ Cam, La Funk Mob, Robot Koch, Flako, Instra:Mental, DJ Seeq, Sense, Sleo, Asc, Brand Nubian, Snooze, B.L.X, Broke Dancing, Rumpistol. You can follow any responses to this entry through the RSS 2.0 feed.